There’s also traffic, exposure, leads, brand identity and so on. The truth is there’s no way you can ever really know how well your business is doing… unless you can find a way to measure the impact of your Social Media posts, website articles and split tests. This is particularly true when you’re starting a business. So simply looking at how much money is in your bank won’t help you gauge success. • Are you finding potential customers? • Are you spreading the word about your products and services? • Are you building an audience of potential clients? • Are you getting attention? • Are you able to turn interested prospects into email subscribers or paying customers? That’s why we need to look at metrics to measure the results of our marketing. The more metrics you measure, the more accurately you can see your progress and then target your efforts on the most effective marketing. One of the best and easiest places to get this kind of data is via your website. First make sure you install Google Analytics on your website. It’s free and includes a mind boggling array of stats, options and customisations. If you have a WordPress website you can integrate Google Analytics in a jiffy by installing a free Google Analytics plugin. This will save you a chunk of time on the standard Google Analytics setup, as the plugin will do the integration for you (meaning you don’t have to muck about with any coding or file uploads). There a few different ones to choose from, all free. I like Monster Insight’s offering which you can see here. If you’re not on WordPress, not to worry, the Google have a number of help files on integration. It’s worth bearing in mind that even though the setup process can take as little as 5 – 10 minutes, it can take Google 24 to 48 hours to start tracking data. In the above screenshot you can see that there have been 3,208 users of the site, viewing 5,305 pages and spending an average of 51 seconds on the site. The ‘bounce rate’ measures the amount of time a visitor spends in a single session on your site before clicking off the site. You’re looking or a 40% to 60% rate. This one is over 80%, however, blogs sites and news sites will have higher bounce rates. But a statistic like this means you may need to work on drawing visitors into your website a bit more, getting them to view other pages. Of course, these stats mean nothing unless you put them into context. Are your marketing efforts increasing traffic over time? 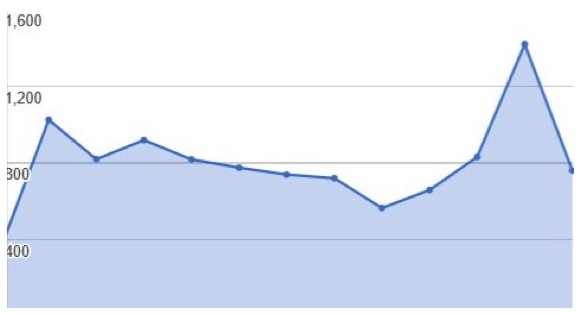 To work this out, Google Analytics offer a graph like this. Again, you can set that graph to any time period you choose. In this example, there is an overall improvement in traffic, but there was a slump. You can look back over your marketing during that slump to see what might have caused this. It could be that you were less active on social media, you wrote fewer blog posts, or you didn’t release any products or do any publicity. In the above example you could also look at the two spikes in traffic and see what you were doing at that time, so you can try a similar tactic again. The stats also show you ‘organic search’ results. This refers to how many people found your website through Google’s search engine. In this case 1,344 people came to the site (almost half) through Google search. Here you can see where your visitors are coming from: organic searches, direct visits to the website, social media and referral from links on other sites. Again, if you keep measuring this, you’ll know exactly how well your social media and organic search marketing efforts are doing. You’ll be able to see which blog posts have generated the most traffic. Often, the posts that you ‘feel’ got the most attention on social media – or the ones you liked the best – aren’t always the ones that got the most traffic. So it’s important to analyse the data rather than relying on your perception. It’s a good idea to put your website stats in the context of your overall business. After all, you’re trying to make money here. Having more traffic, more page views and a better bounce rate is of no importance if it doesn’t impact on your bottom line. So rather than simply measuring your success based on these stats alone, always cross-check them with your rates of conversion. • Sign-ups to your email service – are your web visitors joining the email database, giving you a powerful marketing platform for direct sales? • Unsubscribes – likewise, if people are leaving your email service it could be that the promises and claims you make to draw people in aren’t matching up to what you deliver? • Enquiries – also look at the number of enquiries, including from your website, by phone and email, or footfall if you have an offline premises. • Social media – a growing social media following indicates that you are becoming better known and more credible. 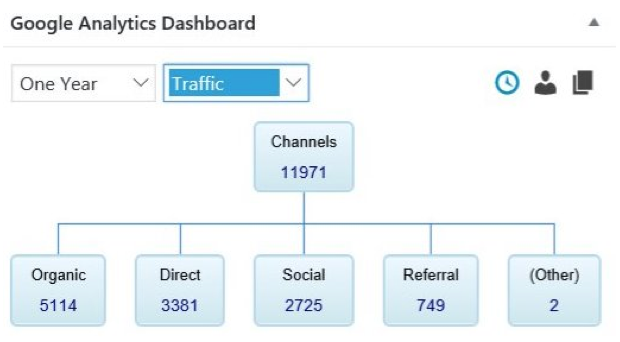 Track this along with your web statistics and you can see how well social media is converting into traffic, subscription levels and sales. • Feedback – track the comments beneath your posts, as well as complaints, criticism and praise on social media and online forums. • Web-shop clicks – if you have an eCommerce platform on your site, look for an increase or decrease in activity and compare it to your marketing activities. • Direct sales – are people buying products from your website and your sales promotions? How do these correlate with your marketing performance? TOP TIP: A quick and easy way to automatically measure some of these metrics is to setup performance goals from within Google Analytics. You can find a simple, free explainer here. Ultimately, by keeping track of precise metrics like these, you get an objective view of how well your business is doing, with a better understanding of what works and what doesn’t. That means you can put more effort into the marketing activities that get you the best results.